Anthony is doing a great job, the solar system is powering 4 class rooms by now. He advised against fixing the panels on the roofs as these days high winds have been lifting roofs off, this time elsewhere - our roofs are pretty solid. So we need to construct a separate place to mount the solar panels. Work is going well on building the dining hall and kitchen. The wall is up 2/3 by now, so some more rows of bricks and the roof can be built on. Many people are moving from Northern Sudan to the South, there is quite an influx in Aweil area as well. This means that more children need a school place, and our school has now registered 350 girls (nursery children not included). Today, after a long time running after the visa for Anthony, the solar engineer from Nairobi, Anthony flew to Aweil. Two consignements of solar equipment are in Malek now, so he's got some assembling to do. Of all the bits and bobs there will be one item that will never need assembling - the sun! After making all the arrangements Glenn got home on Tuesday afternoon. He is OK but will visit the GP for a check-up. We will keep in contact with Joseph and give regular updates. 6am local time saw Joseph and Glenn at Wilson Airport Nairobi supervising the loading of the first batch of the equipment and baggage for the flight to Aweil. All went well and Glenn was able to rearrange for the second flight with Anthony, the engineer to go on Wednesday rather than Tuesday. 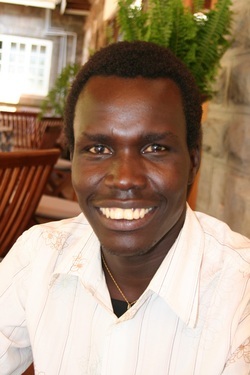 Anthony had not yet got his Visa and today is a public holiday in Kenya with the office of the Representative of the Government of Southern Sudan closed until Tuesday. All the planning and effort that has gone in to the preparations for the trip could not foresee the state of Glenn's health. He is not too ill - nothing for anyone to worry about - but it would be unwise for him to travel to Malek Alel so this afternoon saw us at the airport rearranging his flight back to London. Joseph will continue on to do as much of the work we planned as he can. Glenn has been running a crash course on video making, computers and interviewing so we should still be able to get some material for the website and for schools. Please pray for Joseph as he continues the visit. All the documentation and supplies and luggage have been taken to the airport and are being loaded over the weekend ready for an early start on Monday. We then set off at about 3pm - we hoped to leave around noon! - on the three and a half hour drive up to Turi to see Shirley. That was three and a half hours without Nairobi traffic and torrential rain, but Hudson, our driver, managed to deliver us safely only 20 minutes later than we would have expected. We had a good evening with Shirley and with Joseph's god-daughter, Anna who is doing a gap year in the school. (http://www.standrewsturi.com/ - a bit different from the school in Malek!). We also met Chris and Sonia Donnan who are on the staff at the school and are heavily involved in developing community projects some of which we wanted to learn from for Malek. You can find out more about the work they are doing at http://www.molostreetchildren.co.uk/. After a good night's sleep (at 8,000 feet the air is cool and clear) we had a hearty breakfast and a tour of the school, meeting and greeting as we went. We had a good discussion with Paddy Moss, the headteacher of the Preparatory School and we will hopefully be able to establish mutually beneficial links. The drive back in contrast to yesterday was in sunshine with light traffic which meant we could enjoy the views of the Rift Valley and the sight of zebra, gazelle and baboons by the side of the road. Settled the account for the solar panels and arranger the visa for the Anthony, engineer. Met Joseph's cousin Mathiang Alou Mamer, who helped Joseph arrange the school uniforms for the girls in 2010 and who helped with the visa for Anthony. 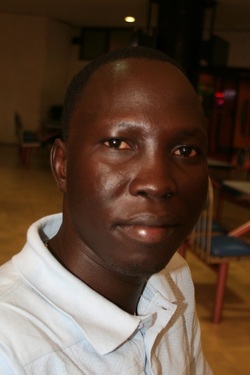 We also met Jacob Ruay Dut who was one of the students sponsored by UTS between 2004 and 2007. He is studying for a Business Administration degree at the Kenya Methodist University in Nairobi and is in his second year. He joined us for lunch at the Sarit Centre. Tomorrow, we will be going back to the Airport to finalise the flights for Monday and Tuesday and then heading up to Turi to visit Shirley Rogers, a former parishioner art St Chad's in Kidderminster who is teaching at a school there.. The joys of being driven around Nairobi. Today has seen us going from meeting to meeting to finalise the arrangements for the purchase, packing and shipping of the solar panels coupled with trying to get a local SIM card that works for Joseph's telephone (success!) and trying to figure out why Glenn's IPod (with loads of photos to share on it) suddenly demands a log-in code (no luck so no IPod!). Otherwise a very fruitful day. Though the roads and the driving in Nairobi have not improved noticeably! Flight on time and we had leg room seats, so very comfortable. Immigration and customs went smoothly - especially when Joseph told the customs officers we were in transit to the new country of Southern Sudan. Almost sparked a party!. Journey to the guesthouse went well and the rooms are comfortable. We think we will sleep if we can filter out the crickets!. Busy day tomorrow so hopefully much to report then.